French playing cards (jeu de cartes) are cards that use the French suits of trèfles (clovers or clubs♣), carreaux (tiles or diamonds♦), cœurs (hearts♥), and piques (pikes or spades♠). Each suit contains three face cards; the Valet (Knave or Jack), the Dame (Lady or Queen), and the Roi (King). Aside from these aspects, decks can include a wide variety of regional and national patterns which often have different deck sizes. In comparison to Spanish, Italian, German, and Swiss playing cards, French cards are the most widespread due to the geopolitical, commercial, and cultural influence of France and the United Kingdom in the past two centuries. Another reason for their expansion was the simplicity of the suit insignia which simplifies mass production and the popularity of Whist, Contract Bridge, and the recent Poker boom. Playing cards arrived in Europe from Mamluk Egypt around 1370 and were already reported in France in 1377. The French suit insignia was derived from German suits around 1480. One of the most distinguishing features of the French cards is the Queen. Mamluk cards and their derivatives, the Latin suited and German suited cards, all have three male face cards. Queens began appearing in tarot decks in the early 15th century and some German decks replaced two kings with queens. While other decks abandoned the Queen in non-tarot decks, the French kept them and dropped the Knight as the middle face card. Face card design was heavily influenced by Spanish cards that used to circulate in France. One of the most obvious traits inherited from Spain are the standing kings. Kings from Italian, Portuguese, or Germanic cards are seated. Starting from 1745, cards became reversible, relieving players from having to flip face cards right side up. In the 19th century, corner indices and rounded corners were added. The index for Aces and face cards usually follow the local language but many decks of the Parisian pattern use the numeral "1" for aces. Finnish cards use 11, 12, and 13 on the indices of their face cards. The French suited deck has spawned many regional variations known as standard patterns based on their artwork and deck size. The French national pattern (portrait officiel or Parisian pattern) is closely followed by Walloon, Genovese, Piedmontese, and Romandie patterns. Though Genoa and Piedmont are very similar to the French, the Italians also have the distinct Tuscan and Lombard patterns and the Trente et Quarante game comes with its own pattern. German speaking areas have spawned the North-German, and Rheinish patterns which inspired the Dutch, Danes, Russians, and Swedes to make their own national patterns. The English pattern, based on the Rouennais pattern, is the most well known pattern in the world. Note that patterns don't include Jokers as they are a very recent addition which leads to every manufacturer making their own trademarked depiction of this card. The Parisian pattern came to dominate in France around 1780 and became known as the portrait officiel. From the 19th century to 1945, the appearance of the cards used for domestic consumption was regulated by the French government. All cards were produced on watermarked paper made by the state to show payment of the stamp tax. The most common deck sold in France is the 32 card deck with the 2 to 6 removed and 1s instead of Aces. The face cards are associated with historic personages. The Walloon and Genovese patterns are very similar. They drop the names and use different colors in the portraits. Genovese decks also lack corner indices. 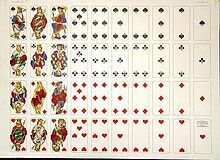 Piedmontese cards are similar to the Genovese packs but their face cards have a horizontal instead of diagonal dividing line and decorated aces. The Romandie (or Swiss-French) pattern is also horizontally divided and its face cards appear to be an intermediary between the Piemontese and North-German patterns but their most distinguishing characteristic is that instead of having corner indices, white Arabic numerals are found within the pips closest to the corner. Romandie cards comes only in decks of 36 with no ranks from 2 to 5. Card makers from Rouen began exporting to England around 1480. Since Latin-suited cards were already circulating in England, the English renamed French suits to the Latin ones they were familiar with. Hence the clovers were called clubs and pikes were named after the swords (spade). The English didn't start producing their own cards until a century later. In 1628, the importation of foreign playing cards was banned to protect local manufacturers. English cardmakers produced lower quality cards than their continental counterparts leading to the loss of detail from the Rouennais pattern. Today's pattern is the result of Charles Goodall and Son's reworking of the old Rouen pattern during the 19th century. The majority of decks sold in this pattern is the 52 card deck. 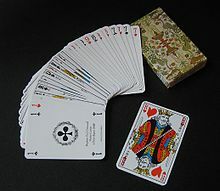 One deck invented in the US but more commonly found in Australia and New Zealand contains 11s, 12s, and red 13s to play the six-handed version of the Euchre variant 500. Decks marketed for Canasta often have card point values printed on the cards. Lyon was a card major card exporter to German speaking countries from the late 16th through the 18th centuries. While the Lyonnais pattern died out in most places, it survived in Austria and the Czech Republic and its modern incarnations are the Viennese patterns.The "large crown" version lacks corner indices while the "small crown" version includes them. They come in decks of 24, 32, or 52 cards. The Lombard or Milanese and the Tuscan patterns have 40 card decks that is missing the 8s, 9s, and 10s and lack corner indices. The Lombard decks exported to Swiss Italian regions contain corner indices and also labels the ranks of the face cards. The Tuscan pattern is the only French suited deck that is not reversible in the present. Cards marketed as "Florentine" are larger versions of the Tuscan pattern. French suited cards are popular in Central Europe and compete very well against local German playing cards. This led to local manufacturers making their own patterns. Card-makers in Hamburg began revising the Parisian pattern which was continued by producers in Stralsund. This led to the creation of the North-German or erroneously named Berlin pattern. The crownless queens' hairstyles reflect the Biedermeier fashions of the day. They are usually in decks of 32 cards with the 2s to 6s missing since Skat, Germany's most popular card game, doesn't require a full deck. 52 card decks usually include 3 jokers but Zwicker decks have 6 jokers. Around 1870, Dondorf of Frankfurt produced the Rhineland pattern which come in decks of 24, 32, or 52 cards. Unlike the earlier patterns which depict flat monochromatic faces, the North-German and Rhineland patterns added depth, modernity, and vibrancy to their face cards. These two patterns inspired northern and eastern European card manufacturers to create national patterns based on them. The face cards of these Tarot decks are unique from local patterns and so they constitute separate patterns of their own. Their trumps also abandoned the traditional allegorical motifs found in Italian tarocchi decks in favor of new, more whimsical scenes like depictions of rural life. The Industrie und Glück (Industry and Luck) tarock deck of Central Europe uses Roman numerals for the trumps. It is sold with 54 cards; the 5 to 10 of the red suits and the 1 to 6 of the black suits are removed. The Cego deck is used in Germany's Black Forest and has 54 cards organized in the same fashion as the Industrie und Glück but the trumps use Arabic numerals in top centered indices. The Tarot Nouveau has 78 cards and is commonly played in France. Its trumps use Arabic numerals but in corner indices.